[By Nick] I know the new ice cream season is off to a busy start but let’s look an eerily familiar sounding Caramel Chaos from the free shipment Chocolate Shoppe sent me.They describe it as “Luscious caramel ice cream packed with mini caramel cups and gobs of marble cream caramel.” If you ask me, that sounds like an elegantly worded version of Ben & Jerry’s Triple Caramel Chunk. At least Chocolate Shoppe doesn’t refer to their mini caramel cups as chunks. Removing the lid reveals a nice beige color base. I’m going to keep the comparisons going because this barely looks any different from TCC. Let’s scoop down a little bit. Yeah, this looks exactly like TCC. I even went as far as to pull up the photos from my review and compare the two. I would be hard pressed to tell them apart side by side. Sure Chocolate Shoppe has a slightly darker color but not by much. It’s kind of amusing just how similar looking these two products are. Well you know how I said this flavor sounded and looked a lot like Ben & Jerry’s? It tastes exactly like it as well. 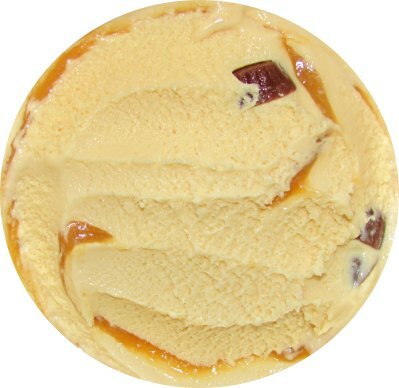 The caramel base is very mild and the majority of the caramel flavor comes from the swirls and mini caramel cups. The caramel swirl, while not quite as good as Ben & Jerry’s, is well executed. The butteriness is on point and it’s not tooth-achingly sweet. It’s also very abundant so you’re getting some swirl in each spoonful. The only con is that it doesn’t have that stringy quality I associate with a good caramel. It’s thicker and more fudge like than I prefer my caramel. 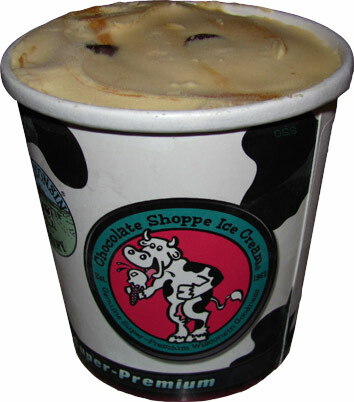 As for the cups, well I wouldn’t be surprised if Ben & Jerry’s and Chocolate Shoppe have the same supplier. They look and taste exactly the same. At least this time I remembered a coin for size reference. There’s nothing else I can really say about this flavor that I haven’t said before. If I had to choose between the two, I might give Chocolate Shoppe the upper hand for the excess caramel. It’s a really close call though. With all that said, there are still better caramel focused flavors in the freezer isle I’d pick up before either of the two. Buy Again? Not when I have flavors such as Talenti Sea Salt Caramel at my disposal. I don't know where this company distributes because I've never seen their products in my area but I love the cute cow on the packaging!